Favourite holiday destination – Rome was great, especially the Colosseum and surrounding ruined palaces. 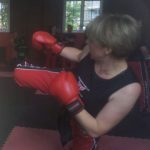 Hobbies and pastimes – Martial arts: I’ve been involved in Martial Arts for 30 years as a student, fighter and instructor, and I’m now a 4th Dan Black Belt and senior instructor with Phoenix Martial Arts. I also enjoy weight training, rugby, sports in general, and the yin/yang is my love of plants and gardening. I love being outdoors either in my garden or on dog walks in the fantastic forests around Warminster. My love of all things botanical and beautiful: I named my daughter, Eden. Tea or Coffee – Coffee all the way… I make a pretty decent cappuccino. Phobias – Snakes; after a few scary experiences finding adders as a child, including a trip to the rhubarb plant, where I plunged my hand into and Adder’s home complete with babies…luckily Mrs Adder was not home at the time. I couldn’t live without my.. Dog, Reggie the staffie, as he is my buddy and great company when the rest of the family are out n about. 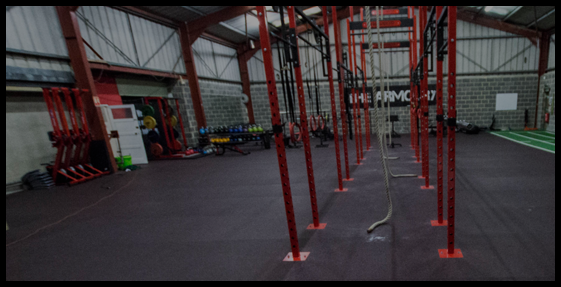 How long have you been a member of the gym – I joined The Armoury almost 2 years ago, just before hitting 50, and with a target of doing some extra training to lose some unwanted pounds and gain strength to complete a Tough Mudder…all of which I did and at the same time I realised that I really love lifting weights. What did you do to keep fit before you joined the gym? Martial Arts training/teaching with PMA Kickboxing Warminster, which is an integral part of mine and my family’s life. At my clubs we do a lot of fitness as well as technical skills and fight skills, training kids and adults from beginner to black belt. I also do an occasional bit of running but am not a fan, so just do it to prove to myself that I can. What’s your favourite exercise in the gym? I like deadlifting but actually really like all of it. How often do you train? 2-3 times a week at the moment, and hoping to move back to 4-5 times a week in the next month. What are your training goals for 2018? I’m trying to improve on the rower, and posted a time up on the board the other day, while marvelling at the times that some of the folks have posted, considering that my lungs were bursting …I have a lot of improvement to make but I’m up for it! If you see me flailing around on the rower, please do come over and say hello and show me me to improve! Favourite thing about the gym? Loud music, all the energy from everyone else training hard, which is the vibe that I love to be around as it really energises me. What would you say to anyone thinking about joining the gym? Just come in and give it a try. I’m like many people; happiest training somewhere I know and am comfortable and where I know what I’m doing! For new folks a gym full of amazing fit people can seem daunting when that’s not how you perceive yourself, or if you’ve gotten out of shape, or are absolutely new to it all, so a nod or hello and being able to ask for help and advice from the experts is very welcome.